Fire triggers two distinct types of smoke damage: soot harm and invisible odor. If not detected and prepared, they may be harmful in their own manners. The recovery of home, thus then is dependent upon the type of smoke and burn. However, the disposition of smoke differs, as it might migrate into the areas that may have not been directly influenced by fire. Our Certified Technicians are reliable and understand that a quick response is critical during a crisis; therefore, we’re very fast in providing our fire damage restoration services. We have great pride in treating your valuables with certain care and consider them as our very own belongings. We’re accessible for you 24 Hours per day, 7 days per week. He/she will provide you with all the necessary information required, and will provide you with instructions if need be. While you might think of damage from fire as being the most devastating part of a house fire, generally it’s the smoke and soot that are more damaging to property and structures, and most poisonous to individuals in the long term. Smoke contains compounds that smell bad and can lead to damage to people’s lungs, and soot is a greasy substance that can stain and damage your walls, furniture and linens. 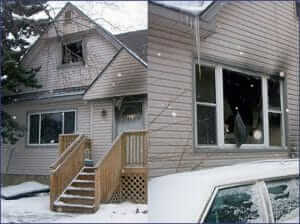 An expert professional fire damage cleanup & fix service like Vital Restoration can eliminate the invisible odors and substances of smoke damage, and execute detailed and comprehensive soot removal.You might have discovered that, through a fire, smoke is much more harmful to people than flame, since smoke can make it hard to breathe and see. That’s because smoke rises and quickly fills a space from the top down. If you breathe in too much smoke during a fire, you might easily suffocate. After the fire was extinguished, the smoke that spent all that time on the walls and ceiling may leave deposits of harmful chemical chemicals embedded in your own walls. Even following the soot and other visible traces of smoke damage are cleared, imperceptible compounds can prevent lingering odors and dangerous compounds. Our thorough smoke damage cleanup eliminates these compound traces entirely so that your family can be secure in the knowledge that no harmful traces are left embedded in your ceilings and walls. Soot is the end result of wood and other fuels not being completely consumed by fire. During a fire, soot increases as fine particles of carbon and trace chemicals. Since the fire is extinguished and the air cools, soot is deposited on any available surface as a greasy stain that can leave lasting smudges on anything it touches. Removing soot demands delicate and comprehensive work. Santa Rosa along with Mountain View ares along with Santa Rosa and Oakland are all well within the Vital Restoration extended fire damage recovery service area. Experienced professional fire damage repair services such as Vital Restoration can easily and thoroughly eliminate soot and revive your walls and land to their former state. Inexperienced or inadequate soot removal can result in worse damage than simply leaving it alone.